Sisterhood was born out of wanting to connect with like minded souls, to collaborate creatively and find my true tribe, my SISTERS. And I did, we did, all twenty-five of us, left on Sunday morning feeling that something truly magical had happened. Being a blogger, it is my role to create beautiful content to share on social media. Social? It is actually quite laughable, as I feel my job is anything but ‘social’. Sitting at my kitchen table most days, tapping away at my laptop. It is a lonely life. I needed to connect, to reach out to people and get back to nature. Guest list set, I invited twenty-five brilliant women to join me in a weekend of workshops, feasting and laughter. Luckily, they all said yes, and kindly offered help in workshops, styling and support – in the true spirit of collaboration. My heart was full. These twenty-five women, most of whom I had met at a blogging event or two over the years. A few hours of rushed conversations before running to catch trains and heading back to our families. There was never enough time to fully connect. Now, they were here, at Loveland Farm in North Devon, with a weekend stretching out before us, conversations to have, giggling like schoolgirls at bedtime, whispering secrets of our past and planning collaborations in our future. Connecting, collaborating, offering advice, inspiration and love with open hearts. It truly was, is, a beautiful thing. 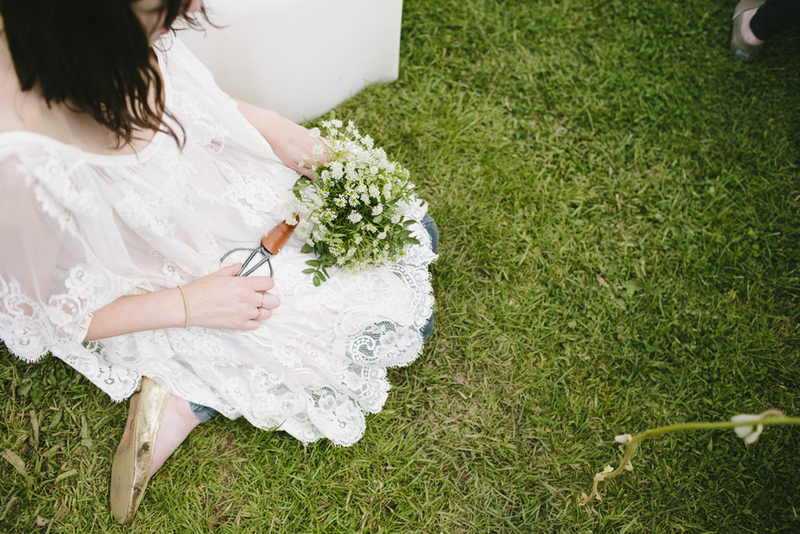 Friday night saw the countryside bathed in the most gorgeous golden light, knowing immediately this was the right time for the Toast shoot, we gathered up linen nighties and kantha gowns and walked the pretty lanes to find the perfect field, gathering hedgerow blooms as we walked. What happened next could only be described as ‘stuff of dreams’ – well my dreams anyway. We were living in Instagram. The light, the company, the collaboration all coming together to form a perfect evening – I shall never forget it. Permanently etched on my mind. A big thank you to Xanthe Berkeley for directing the most beautiful of shoots… you can see more of this on the Toast Travels blog soon. During the weekend we were treated to many workshops, yoga, shibori, leather craft, flower crown making – gorgeous food and sunshine! Yes the sun shone! Golden light making everything dance with magic. Saturday morning, we woke early, and Melanie took us through the most relaxing yoga session, feeling so chilled afterwards, we all vowed to stretch more! 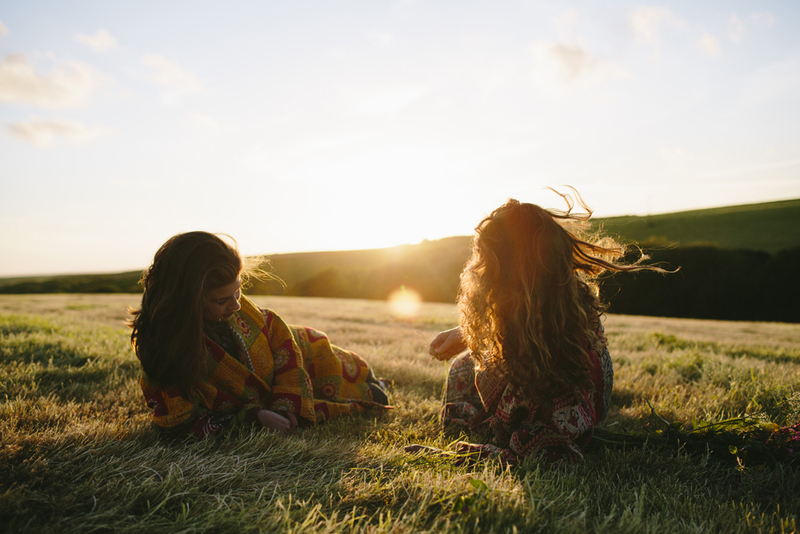 The perfect way to wake up, the SISTERS, yoga and sunshine in Devon. After breakfast we all gathered on the lawn to discover the ancient Japanese art of shibori – folding and dying of fabric with indigo. Heather and Bethan – shared their tips, and soon we were folding fabric in the sun. After an hour in the Indigo, the fabric was revealed and hung on the line to dry. The result was incredible, such prettiness! The next workshop was run by local leather crafts woman, Louise of Golden Bear Belts. Lou, draped in gold, was a sight be seen. Sitting on the deck of the larger pod, she shared with us her techniques. Soon we were all sitting together making leather cuffs, hammering marks and letters into them with gusto. 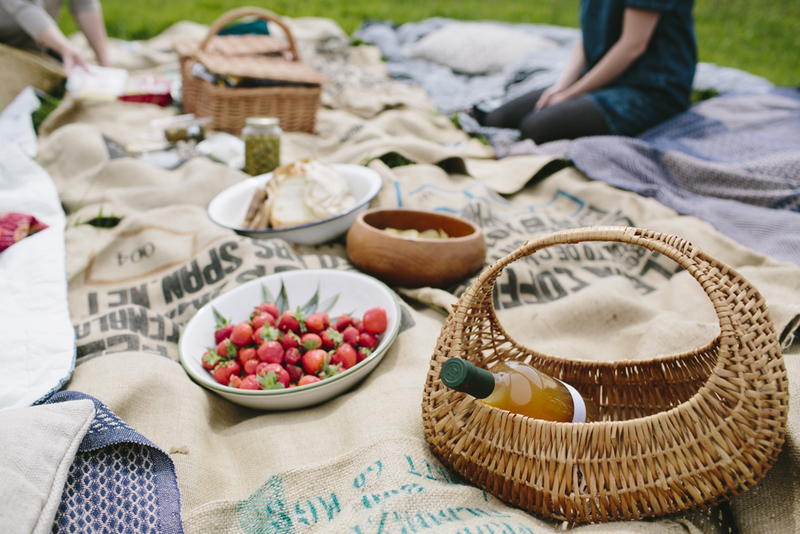 Lunch – a picnic set on top of the cliffs overlooking Hartland Quay. 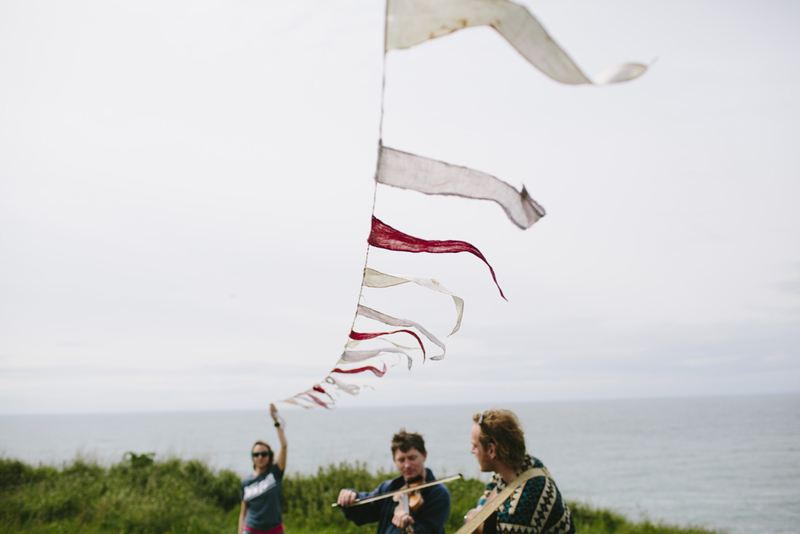 The dramatic coastline was made even more beautiful with the arrival of a folk duo (woof & wilde) who serenaded us as we ate. Kismet, when universes collide, a chance meeting – and perfectly Sisterhood. The afternoon was filled with flowers and collaboration. Some of the group walked to the nearby waterfall for a spot of wild swimming, whilst others created flower crowns to wear at dinner. Heather of Church Park Flowers, kindly bought jars of greenery from her garden, and we all delighted in creating beautiful crowns. Some were larger than others – what was I thinking! Saturday evening, as the dusk fell and the rain set in, we gathered in the large pod. A beautiful space styled by the brilliant Hannah Bullivant. Festoons of lights, tables draped in gorgeous linens and jars of greenery decorated the tables. So that was SISTERHOOD – my dream came true. My heart is full, my mind is brimming with ideas and most of all I have made true friends with these brilliantly creative and talented women, my tribe, my SISTERS! SISTERHOOD CAMP 2015 from xanthe berkeley on Vimeo. Sisterhood – to support, nurture and share creativity.